Everything is perfect. House is in an idyllic place, with trees around the house an a small lake in front of it. It has kitchen, dinning room, restroom, shower and sauna un ground floor and three bedrooms and restroom on first floor, which can be accessed only from outside of the house. A nice porche on ground floor and a beautiful terrace in first floor. Sandra is very nice and welcoming, and had the house pretty warm for us on arriving. Best place we stayed on a two weeks trip through the baltic republics. Idyllic! Beautiful accommodation - very comfortable. Host immediately endeavoured to resolve the problem regarding the failure of the front door lock - this was sorted when we returned the next day. On arrival, we weren’t too sure what to expect as we could not see the property from where we had parked but it was just beautiful - the view was stunning. Heaven on earth... 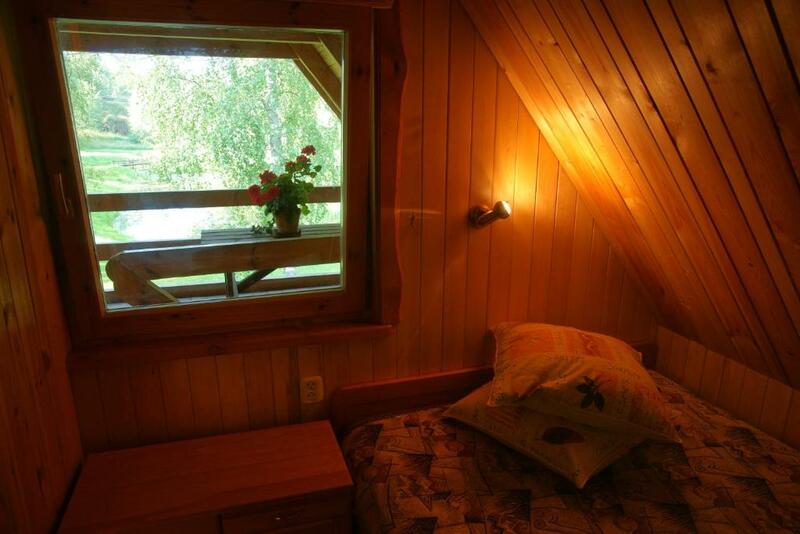 Nature, wooden house with sauna, small river nearby. We liked it very much. Very nice and quiet location close to all the highlights of Gauja National Park. The Holiday house has good facilities and is well equipped (kitchen, games, maps, bbq etc.) The campsite is well maintained and stunning. Everything was fine. Nice wooden house, hospitable and helpfull owner. Piece and quiet. Beautifull place - forest, river, green fields. Desirebale car to go to super and restaurant. 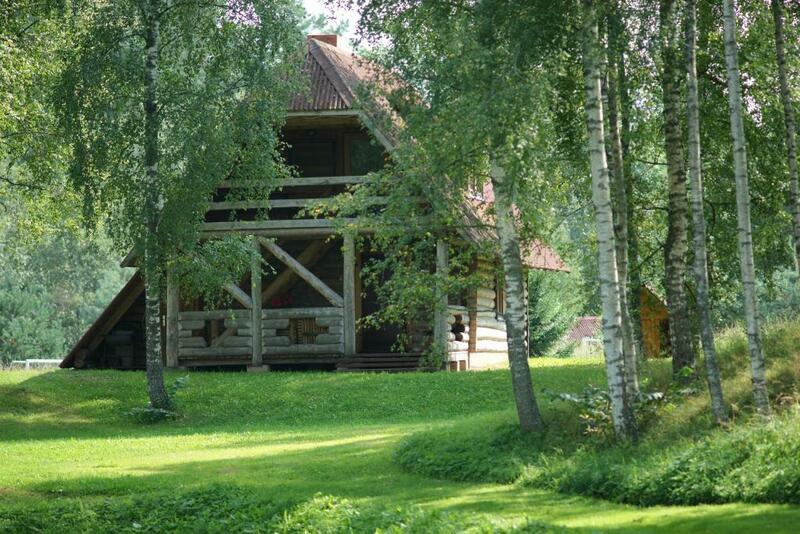 Absolutly all, perfect place for nature and russian sauna lovers! Чудесный дом-сруб в красивом и тихом месте на берегу озера в окружении леса. 54 минуты езды от Риги. В доме очень тепло, баня на дровах маленькая, но хорошая. Симпатичный интерьер, все новое, очень чисто. Приятно, что все было стильно украшено к Рождеству. Камин с березовыми дровами придавал уют. Дом прекрасно оборудован: кухня с электроплитой, микроволновкой, большим холодильником, много разной посуды, много полотенец (в бане в том числе отдельные), хорошее постельное белье, удобные кровати. Любезная хозяйка. Дом идеален для романтиков. Но и для семьи, и для небольшой компании (человек 6-10) тоже будет удобно. Буду рекомендовать друзьям. Lock in a great price for Brīvdienu māja Vējiņi – rated 9.5 by recent guests! Brīvdienu māja Vējiņi is located in Straupe and it is surrounded by beautiful greenery and lakes. It offers accommodations in a wooden house with a terrace. The interiors are done in wood and there is a fully equipped kitchen and a large dining area with a fireplace. The bathroom comes with a shower. You can enjoy a lake view from the room. At Brīvdienu māja Vējiņi the guests can find a sauna and barbecuing facilities. An array of activities can be enjoyed on site or in the surroundings, including horse riding and hiking. The property owners can organize a guided tour of the nearby lakes. The Vējiņi Underground Lakes are 1,650 feet away. This property also has one of the top-rated locations in Straupe! Guests are happier about it compared to other properties in the area. This property is also rated for the best value in Straupe! Guests are getting more for their money when compared to other properties in this city. When would you like to stay at Brīvdienu māja Vējiņi? This holiday home has a fireplace, dining area and a well-equipped kitchen. House Rules Brīvdienu māja Vējiņi takes special requests – add in the next step! Please inform Brīvdienu māja Vējiņi of your expected arrival time in advance. You can use the Special Requests box when booking, or contact the property directly using the contact details in your confirmation. Kitchen perhaps not the easiest to work in - no plug in the sink, sink very low but otherwise quite well equipped for 2 people (at least). Lots of bedrooms but we were not sure how easy it would be to cater for big numbers of guests. Sleeping accommodation accessed by outside staircase. Kitchen is well equiped, but for dwarfs. Stairs to go to the bedroom are outside. It was perfect. Thank you, Yanis!